It might not be a surprise, but it is official -- Michael Phelps is the most decorated athlete in Olympics history. Anchoring the U.S. men's first-place finish in the four-by-200 meter freestyle relay, the gold medal was the swimmer's 19th piece of Olympic hardware. Although Phelps' name has good standing in the hobby already, the record cements his place in history. He's now the measure against which all other athletes will be compared -- at least until his record falls. 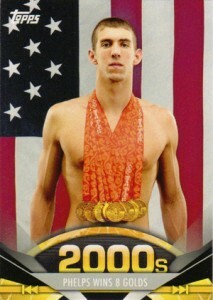 There is no shortage of Michael Phelps cards for collectors to chase. 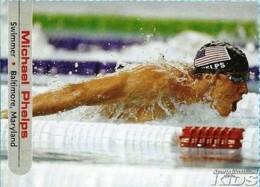 Shop for Michael Phelps cards and memorabilia on Amazon. With eight medals in each of the 2004 and 2008 Olympics, the swimmer became a pop culture icon. His Midas Touch carried over into the hobby. Card companies squeezed Michael Phelps cards into several of their sets. Some remain extremely affordable while others are pricey and elusive. For those looking to start or build a collection of Michael Phelps cards, here are ten top options. This list only includes cards that can be found somewhat regularly. Cards with confirmed print runs of 25 or less are not listed due to their rarity. Rankings are not based strictly based on which Michael Phelps cards are the most valuable. Rather, our picks are based on a mix of rarity, value, design and overall collector appeal. It's subjective, we know, but these ten cards will make for one well-rounded and amazing collection. 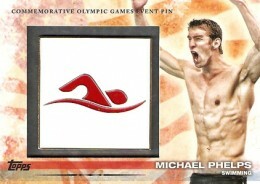 One of the cheaper Michael Phelps cards out there, it honors Phelps' gold medal haul at the Beijing games. With the American flag draping in the background and enough gold hanging from the swimmer's neck to make Mr. T jealous, it's easily one of his best-looking cards. 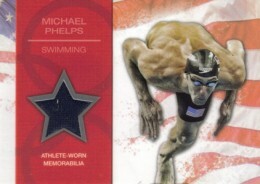 The 2011 Topps American Pie Michael Phelps also has Foil and Spotlight Foil (#/76) parallels. Rather than going with the 2012 Topps U.S. Olympic Team base card, we're opting for the gold parallel. It seems much more appropriate. While tougher to find than his base card (or other parallels), it's still still pretty common as gold cards fall 1:3 packs. The Olympic logo on the front is how you can easily tell the different versions apart. Michael Phelps has just two relic cards so far. This is one of them. And seeing as how it's connected to the Olympics, it seems more appropriate than his 2012 Topps Allen & Ginter Baseball relic card. As much as well love cards, we also recognize there are all types of collectors out there. As far as Olympic collecting goes, there's nothing bigger than pin trading. Topps made a great choice including cards embedded with pins in their set leading up to the London games. One of the first Michael Phelps "cards," this one was included as a sheet in an issue of Sports Illustrated for Kids magazine. Collectors should note that the cards had to be separated so perforations are normal. 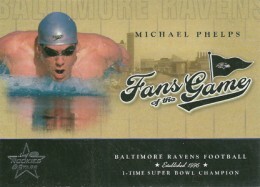 The first pack-inserted Michael Phelps card came from a football card product. Included in Playoff's cross-brand Fans of the Game set that looked at celebrities and athletes from other sports, there is also an autographed version. More on that later. Arms raised in victory, a stylized American flag in the background, a Michael Phelps autograph -- what more could a collector want? Other than an on-card signature, not much. A base set parallel, the 2012 Topps U.S. Olympic Team Autographs set also has Bronze (#/50), Silver (#/30), Gold (#/15) and Rainbow (1/1) parallels. What were we saying about on-card autographs? Although part of a baseball set and not one directly connected to the Olympics, the 2012 Topps Allen & Ginter Champions Autograph Michael Phelps will forever be one of his most coveted cards. A big part of that is because Allen & Ginter is such a wildly popular set each year. But that's not to take away from the elegant design either. Inserted as a separate autograph set focused on past medalists, the 2012 Topps U.S. Olympic Team Champions Autograph featuring Michael Phelps has a striking design. The on-card signature also makes it more desirable than his autograph parallel from the same set. 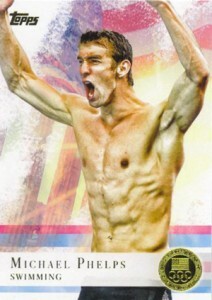 Honestly, this is far from the best-looking Michael Phelps card. However, it is the most iconic. As already mentioned, Phelps' Fans of the Game insert was his first to be found in packs. The basic version is a great, affordable card. However, it's the Fans of the Game Autograph that should forever be the cornerstone to any collection of Michael Phelps cards. Michael Phelps Framed Canvas Print Signed. "Great Gift or Souvenir"
MICHAEL PHELPS SIGNED 2016 RIO BRAZIL OLYMPICS REPLICA GOLD MEDAL 23x GOLD+COA! MICHAEL PHELPS SIGNED 2012 LONDON OLYMPICS GOLD MEDAL USA 23x SWIMMER AUTO+COA!